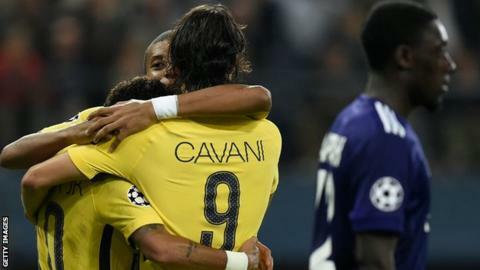 Neymar, Kylian Mbappe and Edinson Cavani all scored as Paris St-Germain maintained their 100% record in this season's Champions League with a 4-0 win at Anderlecht. Mbappe opened the scoring on three minutes with a low shot before Cavani nodded in just before the break. Neymar's free-kick sneaked under the wall and in before substitute Angel di Maria's late fourth capped off the win. PSG signed their attacking trio on deals worth a potential £420m in total. The French side, who fell in last year's last 16 to an extraordinary Barcelona comeback, have scored 12 and conceded none in their first three games in Group B. "We want to make an impression in this competition. We came here to try and win in style and are happy to go back to Paris with the three points," Mbappe, 18, whose eighth goal in the competition made him the highest scoring teenager in Champions League history, told French television. "We had a good game but are aware there are many games still ahead and we need to keep up the intensity. It's a competition where we need to be at our maximum." In total PSG have won 12 of their 13 games this season, with only a goalless draw with Montpellier in September ruining their perfect record. Match ends, RSC Anderlecht 0, Paris Saint Germain 4. Second Half ends, RSC Anderlecht 0, Paris Saint Germain 4. Corner, Paris Saint Germain. Conceded by Josué. Attempt blocked. Kylian Mbappe (Paris Saint Germain) right footed shot from the centre of the box is blocked. Assisted by Julian Draxler. Attempt missed. Ángel Di María (Paris Saint Germain) left footed shot from the right side of the box misses to the left. Assisted by Neymar. Foul by Leander Dendoncker (RSC Anderlecht). Substitution, RSC Anderlecht. Ivan Obradovic replaces Olivier Deschacht. Goal! RSC Anderlecht 0, Paris Saint Germain 4. Ángel Di María (Paris Saint Germain) left footed shot from the centre of the box to the centre of the goal. Attempt missed. Kylian Mbappe (Paris Saint Germain) left footed shot from the left side of the box is just a bit too high. Assisted by Neymar with a through ball. Sofiane Hanni (RSC Anderlecht) wins a free kick in the defensive half. Foul by Adrien Trebel (RSC Anderlecht). Attempt missed. Massimo Bruno (RSC Anderlecht) left footed shot from the right side of the box is close, but misses to the left. Assisted by Dennis Appiah. Kylian Mbappe (Paris Saint Germain) hits the left post with a left footed shot from a difficult angle on the left. Assisted by Ángel Di María following a fast break. Substitution, RSC Anderlecht. Massimo Bruno replaces Pieter Gerkens. Corner, RSC Anderlecht. Conceded by Adrien Rabiot. Henry Onyekuru (RSC Anderlecht) hits the bar with a right footed shot from the centre of the box. Attempt saved. Sofiane Hanni (RSC Anderlecht) header from the centre of the box is saved in the bottom left corner. Assisted by Dennis Appiah with a cross. Attempt missed. Adrien Trebel (RSC Anderlecht) left footed shot from outside the box is high and wide to the right. Assisted by Leander Dendoncker. Substitution, Paris Saint Germain. Giovani Lo Celso replaces Marco Verratti. Substitution, Paris Saint Germain. Ángel Di María replaces Edinson Cavani. Attempt missed. Pieter Gerkens (RSC Anderlecht) left footed shot from the right side of the box is high and wide to the left. Assisted by Lukasz Teodorczyk. Lukasz Teodorczyk (RSC Anderlecht) is shown the yellow card for a bad foul. Foul by Lukasz Teodorczyk (RSC Anderlecht). Substitution, Paris Saint Germain. Julian Draxler replaces Thiago Motta. Offside, Paris Saint Germain. Layvin Kurzawa tries a through ball, but Edinson Cavani is caught offside. Offside, Paris Saint Germain. Kylian Mbappe tries a through ball, but Edinson Cavani is caught offside. Goal! RSC Anderlecht 0, Paris Saint Germain 3. Neymar (Paris Saint Germain) from a free kick with a right footed shot to the bottom left corner. Foul by Dennis Appiah (RSC Anderlecht). Attempt saved. Sofiane Hanni (RSC Anderlecht) right footed shot from outside the box is saved in the bottom right corner. Lukasz Teodorczyk (RSC Anderlecht) wins a free kick in the attacking half. Corner, RSC Anderlecht. Conceded by Thiago Motta. Attempt missed. Kylian Mbappe (Paris Saint Germain) right footed shot from the right side of the box is just a bit too high.